The Seattle Metals Guild announced the winners of its 2014 “Passing the Torch.” It is their annual statewide jewelry and metal arts competition and exhibition for Washington State high school students. This program gives students the experience of exhibiting their metal work and encourages them to consider a life in metal arts. “Felieke van der Leest: The Zoo of Life, Jewelry and Objects 1996-2014” – The work of Dutch jewelry and object artist Felieke van der Leest expresses the very special affection that she has for animals. With unbridled fantasy she creates pieces that ostentatiously, colorfully and playfully revolve around her little friends. This is just one of the interesting books in this week’s news post. From the beginning of time, armor and amulets have been used for protection and are found in cultures across the globe, and those who crafted them have been esteemed as artists by their communities. The contemporary examples showcased here, in 200 eye-catching images, demonstrate the enduring artistry of the forms and the crucial role such objects can play in safeguarding body and soul, especially in our current Age of Terror. An exciting array of protective hardware (armor, barriers, wearable weaponry) and protective “software” (charms, amulets, talismans), reveal a broad range of strategies for human defense. Focusing on work from the twenty-first century, this captivating book features some of today’s finest artists and metalsmiths and testifies to the continued relevance of this creative pursuit. An introductory essay charts the wider cultural terrain of protective ornament–touching on issues of history, anthropology, and psychology, while portfolio sections spotlight subsets of defensive and offensive wear. Among the works of art are helmets, elaborate knuckledusters, pendants, collars, rings, bracelets, metal jackets, and chain mail, all designed for safety. Suzanne Ramljak, a writer, art historian and curator, is editor of Metalsmith magazine and curator at the American Federation of Arts. She has contributed to several publications, and has lectured widely on contemporary art and craft. 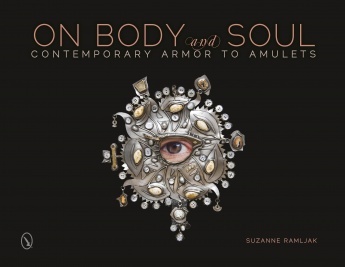 The book is accompanied with an exhibition, Protective Ornament: Contemporary Armor to Amulets, curated by Suzanne Ramljak. The exhibition showcases some 80 works—including helmets, brass knuckles, breastplates, aggressive or defensive jewelry, chain mail, amulets, talismans, and protective gear—all designed to address issues of protection and empowerment in the face of everyday perils and social challenges. On view at The Metal Museum in Memphis, TN through September 7, 2014. The exhibition then travels to the Tacoma Art Museum in Tacoma, WA, October 18, 2014-February 1, 2015.